I have always loved the glamour of dinner parties; the long, enjoyable courses with friends happily engaging in conversation, drinking wine and being thoroughly relaxed. However…they very rarely happen like this. You either spend too much time in the kitchen, or get so into the conversation you burn the main course. I once had a whole meal planned out, to have the guests say six hours before the meal they didn’t eat one of the ingredients. I panicked, changed the main course and the eventual dish was sub-par at best. I was devastated, and knew their noises of appreciation were only to make me feel better. After that experience, I vowed to never host another stuffy dinner party where I spent more time in the kitchen than anywhere else. Hopefully, these tips will help to guide you to the most stress free dinner party yet. Read more after the jump, if you'd like? Whilst you may totally want to have elaborate courses with multiple ingredients, consider your skill level and confidence first. If you’re not good at timings, or haven’t cooked a certain cut of meat before, maybe don’t choose your dinner party to try it for the first time. You want to be relaxed, not stressed over whether the meat will be raw when you cut into it. With saying that, if you do want to try a new dish, research and practice. Scour the internet for recipes and work out what the majority are doing. Are they searing and then baking? Are they blind baking the pastry before filling? Use this time to figure out how much mustard and garlic you like in the sauce, how long your oven takes to cook and most importantly, if you even like it.. Number 3 | Is three the magic number? When I first moved out and started cooking for people, I thought three was the magic number when it came to courses. A starter, main and dessert seemed to be the trifecta of food. However, having hosted multiple parties for multiple groups I have come to realise that in fact, two courses is perfect. Hear me out before you pass judgement. If you have three courses, your guest will have eaten your snacks before dinner, and are uncomfortably full by the end, maybe even a little sleepy! The mood dulls, and they leave. 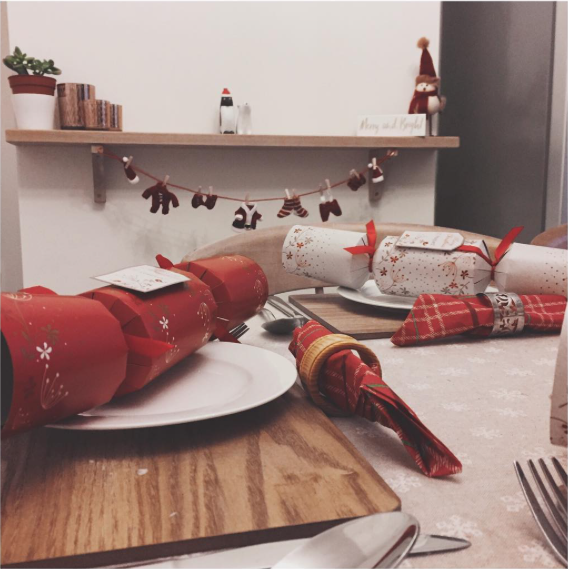 However, if you serve TWO COURSES, they can nibble on snacks and relax with their drinks whilst you prepare the main course, and get cosy in their surroundings. You then serve dessert and maybe a coffee afterwards and then all of a sudden … Games! Conversation! More drinks! Your guest is much more comfortable, you’ve had one less course to prepare. Without the heaviness of all that (kind of unnecessary) food in their belly, the night is young. If you’re all still hungry, there’s always cheese and biscuits! One of my favourite things to do is serve my food family style. This basically means all the food goes on platters or serving dishes in the centre of the table so your guests can choose their own food portions. This negates anyone feeling rude for asking for a second helping, having items on their plate they don’t enjoy eating, and less worry for you as the cook hoping you’ve made enough! My boyfriend says this is old fashioned, but I think it’s rather sweet asking your neighbour for the serving spoons. Have you ever been to someone’s home and not known where to put your coat, shoes or bag? I always make a point of emptying our shoe basket and moving the surplus jackets off the hooks and upstairs to our bedroom. That way, it’s obvious where their items can go, and it overall helps to make them feel more at ease. Number 6 | Staying overnight? If your guests are staying for the duration, or don’t know the layout of your home, make sure to show them their room/bathroom as soon as possible. They can then leave their belongings there if they wish, or freshen up before dinner. If you leave it until later in the evening after drinks and conversation, they could have been waiting to use the bathroom but been too polite to interrupt the cook. I don’t believe there is anything more awkward than a silent house when you arrive somewhere. It’s like being the first person to a house party! I have some fail-safe albums I always go back to for dinner parties that create a nice relaxed vibe to start the evening off. After the initial hour or so, this sometimes gets changed for some more fun, upbeat music, but more often than not it stays on repeat in the background. If they’re willing, let the guest be the DJ so you can get on with ensuring the carrots aren’t soggy. I know how difficult it can be to leave a huge pile of dirty dishes, but please do. Having been to homes where the host is washing up whilst we finish the main course, I’m no fan. I don’t want my guests to feel obliged to offer to help me, and so I always aim to wash as I go. Whether it’s transferring items to serving dishes to ‘keep warm’ so I can wash the pot up, or planning ahead and prepping parts of dishes the day before. Occasionally, stacking the dirty items out of sight of the guests is your only option. Yes, it might not be pretty for you when they leave, but I personally think its worse to have a guest offer to help when they really don’t want to. It’s the easiest to overlook, and the hardest to do, but no one is going to have fun if the host isn’t. Keep it casual in jeans, don’t cry if your guests forget to use the coaster, and laugh it off if the gravy congeals. People came for a good time, so give them one. Nothing is perfect, the ‘ultimate’ dinner party doesn’t exist unless you hire caterers and a venue, and in all honesty, the guests came to spend the evening with you not your food. Chill, you’re doing great. So there you have it, my 10 tips. Would you recommend anything, or do something differently? What’s your go-to dish? I’d love to know!